All shots from the Melbourne Street website are available as limited edition prints. Please specify the title of your print in the comments section of your order. If making multiple orders, just list the prints you would like and quantity of each. All giclée prints are produced at Michael's Camera store in Elizabeth Street, Melbourne. 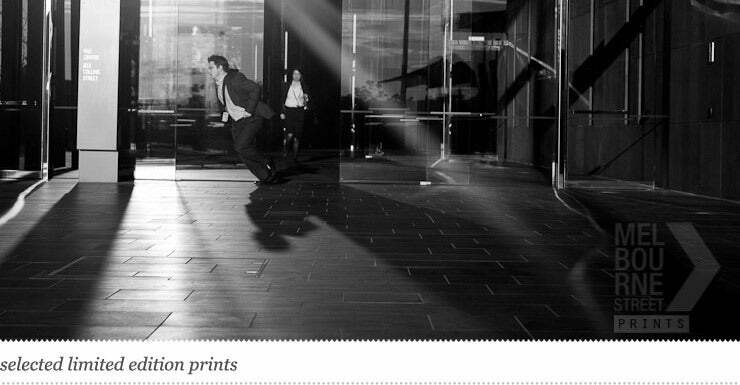 Prints are made on ILFORD GALERIE GOLD FIBRE SILK, which offers enhanced definition, extended tonal range, and excellent archival properties. I leave an approximately 1-inch border to facilitate framing and mounting. I can help arrange framing at additional cost, just email me after your purchase for a quote. Prints are numbered on a first come first serve basis (ie. the first one sold in a series is #1 of 12), and are signed by the photographer. Ships packed in mail tube within 5-10 days of order. Final print does not feature Melbourne Street watermark.